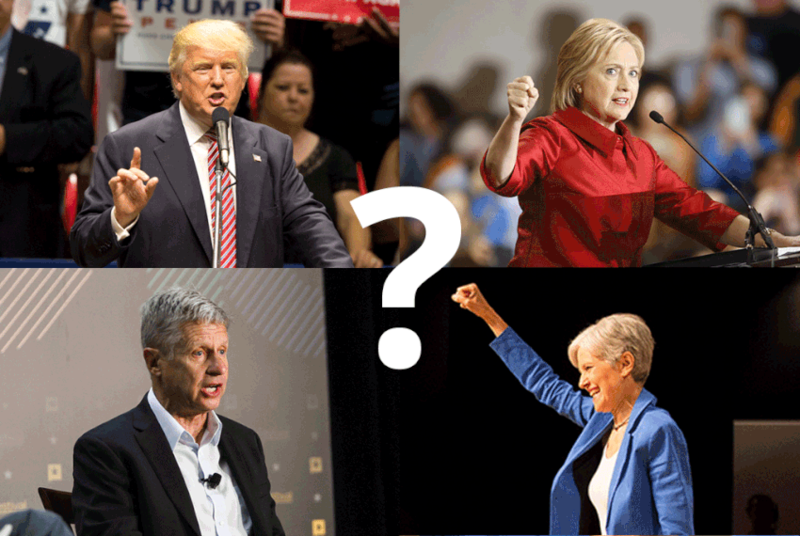 Presidential candidates, clockwise from top left: Republican Donald Trump, Democrat Hillary Clinton, Jill Stein of the Green Party and Libertarian Gary Johnson. Hey, Texplainer: I am a Texas Republican who just can't vote for Donald Trump. What are my other voting options? A flood of Republicans across the country have condemned GOP presidential nominee Donald Trump since the Washington Post released a video Friday that showed the real estate mogul speaking lewdly about women. In Texas, several Republican officials have criticized Trump or called for him to step down from the race. Yet Trump has insisted he's staying through Election Day. For many Republicans, this option remains unthinkable. Yet the Democratic Party's standard-bearer has been attempting to sway Republicans turned off by Trump by emphasizing her experience. At Sunday's second presidential debate, Clinton highlighted her ability to work across the aisle, including her work as a U.S. Senator from New York alongside former Republican president George W. Bush to rebuild New York City after the 9/11 attacks. Alongside Trump and Clinton on the Texas ballot are two other names: Libertarian Gary Johnson and Green Party candidate Jill Stein. Johnson, a former New Mexico Governor, has classified himself as fiscally conservative and socially liberal. His platform includes support for a balanced budget amendment. He also supports legalizing marijuana and access to abortion. Stein, a doctor and longtime environmental activist, ran for governor of Massachusetts in 2002 and 2010. On the campaign trail, she has largely focused on environmental and social justice issues. Neither Libertarians nor Greens have ever won a statewide race in Texas. In most election years, both parties have set their ambitions lower, hoping to draw at least 5 percent of the vote in a statewide race, the threshold that a minor party needs to clear to automatically qualify for ballot access in the next election. For those uninterested in supporting any of the four presidential candidates on the ballot, writing in another name may be appealing, but only certain names will be counted. Write-in candidates were required to register with the Texas Secretary of State by August 22. This year, 13 candidates are registered as write-ins. They include Evan McMullin, a former CIA officer who has drawn the attention of some prominent conservatives as a Trump critic, and Robert Morrow, the former Travis County Republican Party Chair who has gained infamy for his conspiracy theories and outlandish behavior. Bottom Line: For Texas Republicans who want to vote for someone other than Trump, there are three other presidential candidates on the ballot and 13 other registered write-in candidates.